Coaching for dental teams and hypnosis professionals. while raising the standards for patient satisfaction. In 2013 being a professional hypnotherapist I had a chance to manage a small dental clinic. I quickly found that language skills and concepts of hypnosis were applicable in dentistry, not only in the "usual" sense of helping patients improve their quality of life, but also to help dental practices offer a more cohesive VIP type service that accomplishes everyone's goals at the same time. My philosophy is simple: Patients love to be catered to and will become long term patrons of a business that treats them well. And yes, dentistry IS a business that wants (or should) long term relationships with their patients. Sadly, most patients don't feel as if they are/have been/will be treated well, which creates an adversarial position from the beginning of many team/patient communications, and this only compounds and aggravates over time because... well, because humans are strange and we misunderstand each other constantly. I've focused the last few years of work and study on how to improve team presence and communication with dental patients, so that they will feel: motivated enough to actually show up to their visit; comfortable enough to be treated there; and happy enough to refer their friends and family. 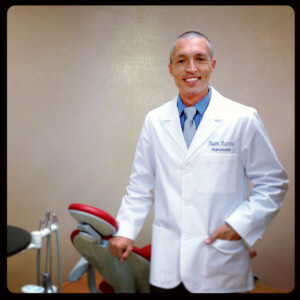 YES, I teach dental teams how to get more patients by making people happy. But how do you make them happy...? Basic hypnosis skill, and a process. Since 2013 I have worked with several thousand patients and taught several hundred dental professionals and hypnotists. 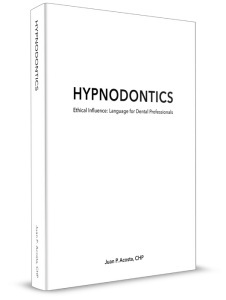 I have worked in dental practices as a patient coordinator, marketing manager, and VIP concierge, and I also wrote the best selling hypnotherapy book on dental hypnosis, HYPNODONTICS, available on amazon. At Hypnodontist I teach simple processes that yield big results. If you're a dental professional, what would it mean for your practice to increase case acceptance even by a small degree, or reduce your no-shows to a minimum? If you're a patient, how would you like a dental practice that makes you feel like you're part of the family? Always remember, those who "care" for you should ACTUALLY care for you. If you're a hypnotist, THIS is what dental practices truly need. Anxiety relief and hypnosis for teeth grinding are great services to offer, but hypnotherapy referrals are mostly a byproduct of your work with the practice. Multiply your impact by training with Hypnodontist. "When a critical mass of dental professionals are using Hypnodontics, many of the issues dentistry as a profession faces today will no longer be issues, and worldwide oral health will improve!" "HYPNODONTICS" Launched in Las Vegas, NV at the Hypnothoughts Live 2014 conference, and quickly became a Kindle best selling title in the categories of Hypnotherapy and Dental Practice Management. When patients are stressed they don't show up to their appointments... or get treatment... or refer anyone. Worse yet, the cause of that stress could range from financial hardship to the sound of your hand-piece. Lucky for all humans involved in this transaction, a small upgrade on your team's communication skills can make it all better. 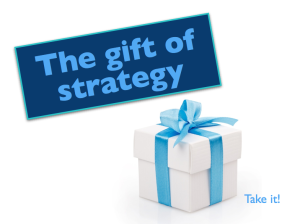 One of the highest costs for any business is marketing to get new customers through the door, except when the proper systems are in place to help happy customers share their experience and bring in more customers. The issue is that getting good word of mouth is not as easy as getting bad word of mouth, and bad word of mouth is like a badly infected tooth. It needs to go. 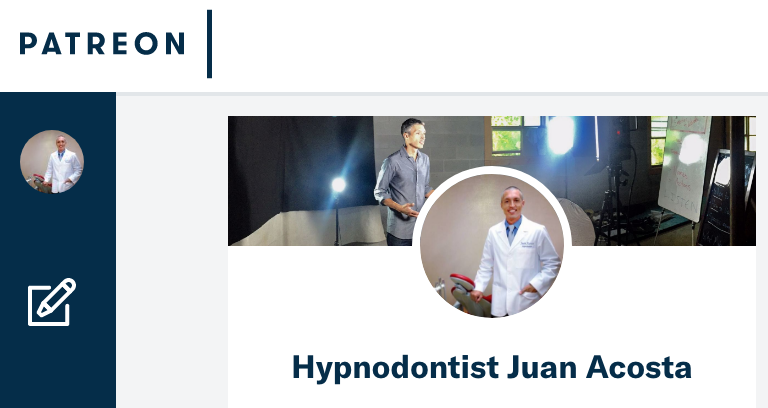 With Hypnodontist's More Patients coaching you and your team will learn a simple engineered process, designed to motivate happy patients to offer you video testimonials and online reviews to use in your marketing. And this is not the typical "We'll give you $25 credit for a review" type of ridiculous marketing effort. This is about "easily" helping patients relax and making patients happy to the point they want to help you too. As a dental professional they taught you a lot of important skills. But in my personal experience most were not taught how to properly motivate humans to do what's in their best interest, such as showing up to their dental appointments. Whether it's an unanswered question or some internal doubt inside your patients mind, when patients don't show up your practice suffers. Your chair is not producing but your team is still being paid, and you're unable to see another potential patient. Ouch! With Hypnodontist's More Patients coaching you and your team will learn the most effective ways to confirm patients using social influence principles and hypnotic language. Your patients will feel great about showing up to their visit, and your practice will run more smoothly. And no, this isn't about huge cancellation fees and arm twisting... it's about a process by which your practice can enjoy the predictability of a schedule that works, and your patients can be properly prepped for their appointment. Hypnodontist's audiences over the last few years estimate their case acceptance numbers to be in the teens... Let that sink in for a moment. That means as a dental professional you put yourself out there financially to get 100 patients in the door, only end up treating 10-19 of them. What happened to the other 81 and who's paying for your time? Low case acceptance rates create non-sustainable practices, and like the other practice ailments above, it's merely a symptom of the issue and not the issue itself. With Hypnodontist's More Patients coaching you and your team will learn how to present treatment plans that get accepted. From proper patient preparation to the delivery of bad news, you can make it better for your patients and yourself with a simple process and a little extra effort. No obligation. It’s my gift to you!